New Hampshire Seacost Mac Users Group – Do You Google It? 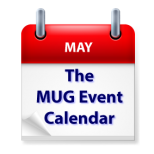 Thursday 18-May Tidewater Macintosh Users Group – How do you use your computer or iDevice? Is it time for a new one? South Jersey Apple User Group – Free Stuff from the App Store: What have you Downloaded and how do you use it? Macintosh Users East (Canada) – Podcasts? ?